It’s been 10 years and 18 movies since Iron Man (2008) came out, and now MCU is approaching at the culmination of everything that has happened till now, as Kevin Feige puts it. Marvel Studios has managed to assemble a magnificent cast under one roof to create a mega comic-book event as part of phase 3. The Infinity war films are the most awaited superhero ensemble movies of the 21st century. Fans are ready to eat the tiniest of hints in the upcoming movies leading to the grand event called Infinity War. 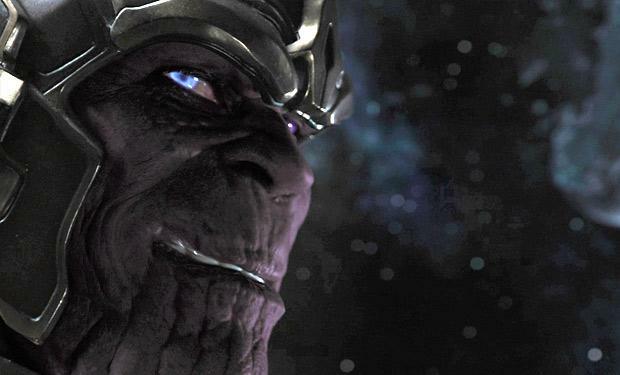 Till now, the Mad Titan has been teased in Marvel movies in post-credits of Phase 2, 3 films, but Infinity war will be the first major project where he is going to be the central antagonist. Thanos will assemble the Infinity gauntlet that makes him the most dangerous cosmic creature who is hell-bent on destroying worlds. 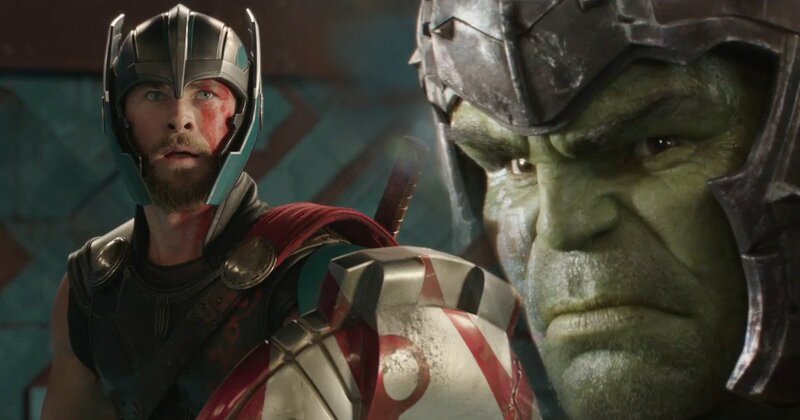 Thor: Ragnarok is the next Marvel movie in the pipeline which will directly lead into the Avengers Infinity War. 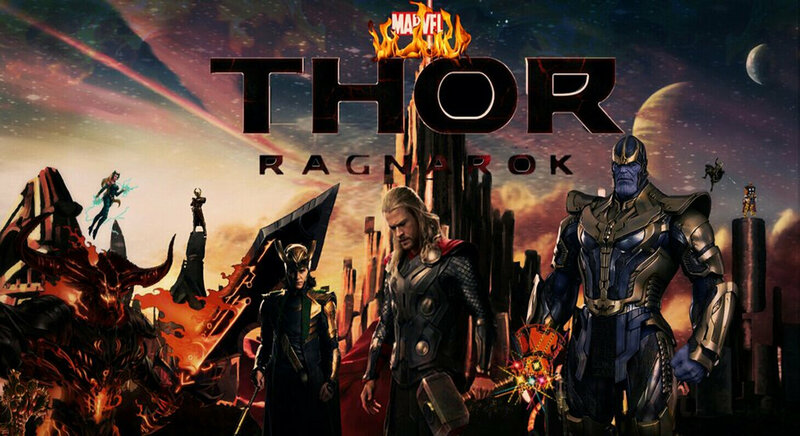 The movie is inspired by Jack Kirby’s Ragnarok comic wherein Asgard is burned to the ground and rebuilt from the ashes. Thor will confront an empowered Loki who he has gained absolute control of Asgard while Thor was busy fighting Ultron on Earth and forces of Hela who command legions of the dead. The new movie will be more action packed and would lead into the Avengers: Infinity War but it will also be the shortest ever Marvel movie. In continuing with the traditions of Thor movies, Kenneth Branagh’s Thor was 114 minutes, Alan Taylor’s Thor: The Dark World was 112 minutes long but Thor: Ragnarok will just have 100 minutes runtime. 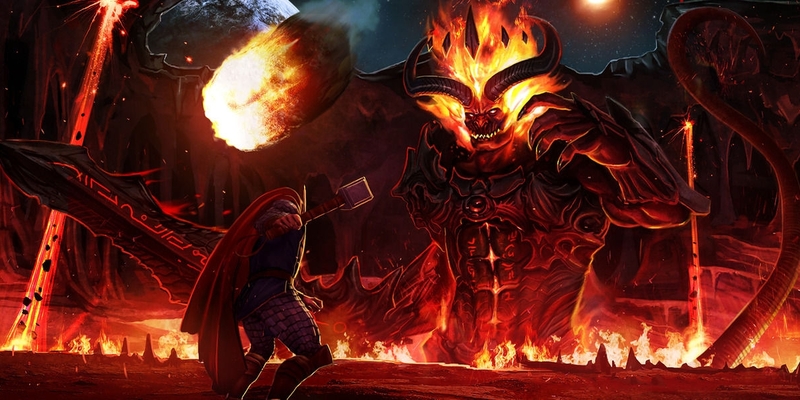 The new trailer and images of the movie also showed a terrifying monster known as Surtur. He is a classic demonic figure of Thor comics who rules Fire realm. He is a giant fiery monster who can do trans-dimensional teleportation, magic, and molecular manipulation. He also features in the Norse poem which tells the tale of Ragnarok. He is a recurring villain in Thor comics, once he destroyed the Realm Eternal. He possesses a mystic blade that can cleave through dimensional barriers, withstand Thor’s hammer Mjolnir making him the kind of enemy that Thor has never faced before. The trailer of the movie has also shown Hela wielding a mysterious blade, summoning fire etc. Once she possessed Twilight sword in the comics and threatened to destroy all nine realms. The trailer also features an armor which is similar to “The Tester” i.e one of Marvel’s powerful celestials. Another Celestial featured in MCU when Collector was explaining the forces guiding the realm, he mentioned “The Searcher”. These are ancient beings which date back to the beginning of the universe. In comics, there is a very powerful armor known as “Godkiller” which transfers the powers of celestials to the person who wears it. If an Iron Man wears this suit, not even Thanos with an Infinity gauntlet can defeat him. Well, it would be an epic spectacle to see Iron Man with Guardians & other Avengers behind him take down the mad titan. The latest teaser trailer of the movie shown at D23 convention may have answered some of the major questions we all have. Although the trailer hasn’t come online, respected publications are reporting it. According to reports, Spiderman will be badly injured, Vision will be captured and Black Widow has a new blonde haircut. 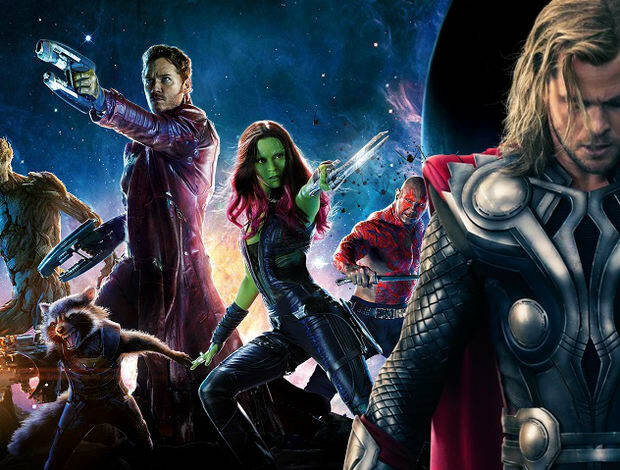 It begins with Guardians of the Galaxy finding Thor floating in space unconscious without a space suit, Mantis waking him up, Thor asks them about their identities. We know that Thor and Gladiator Hulk will battle it out in the arena, but they would manage to escape and go on a “cosmic road-trip”. This suggests that their plans to save Asgard from Hela’s forces may have gone horribly wrong. The key takeaway from the footage is Thor doesn’t win the Ragnarok, he escaped from the Grandmaster but he doesn’t get too far enough to change his outfit. 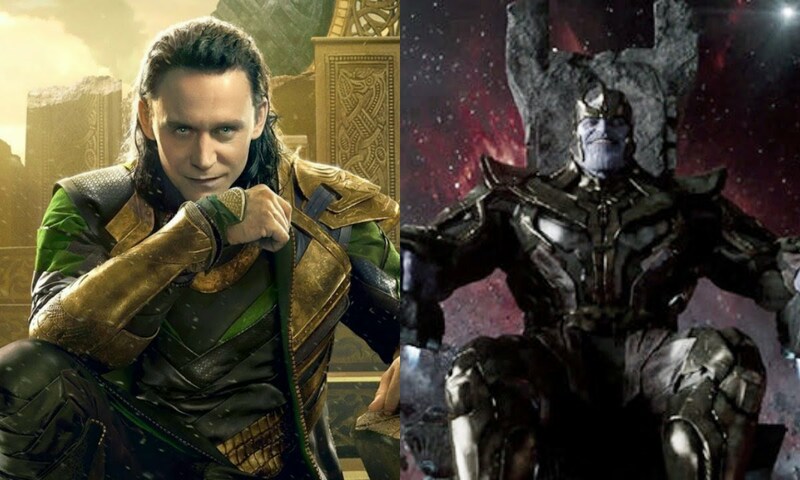 Moreover, the trailer shows Loki handing over Tesseract to the Mad Titan and turns on his brother again. Also, when Guardians are carrying Thor, they see a planet (Asgard) devastated in a huge battle which means Loki has been secretly working for Thanos all along. It is also possible that Thor has beaten Hela but he is terribly hurt and as Infinity war is jumping off Ragnarok directly, Thanos could show up and destroy Asgard. Well, we have to wait and see until May 2018.